LinuxDefender Live! CD was a BitDefender re-mastered Knoppix distribution. It was designed to provide users of both Windows and Linux computers with virus incident rescue tools. Whether your Linux mailserver just got rootkited or your Windows gamestation just got Slammer'd, it's LinuxDefender to the rescue! Just put the bootable CD in your drive to start a turn-key Linux OS which comes packed with almost 1.5 gigabytes of utilities. This distribution contains two world premieres: the world's first ever SAMBA 3 compatible commercial antivirus and FULL NTFS write support - available using the captive NTFS write project. Rate this project Olivier Larrieu has announced the release of Hybryde Linux 13.04, a rather unusual distribution which ships with 11 desktop user interfaces (Enlightenment, GNOME 2, GNOME 3, KDE, LXDE, Openbox, Unity, FVWM, Xfce, MATE and Cinnamon) and which provides a way to seamlessly switch between them without a need to restart the X window system. This it does so via a default home-made desktop called HY-D-V1: "After more than five months, we have a new concept: HY-D-V1 which is a new paradigm for the desktop. It works with web technologies. This new version, Hybryde 'Fusion', includes HY-D-V1 which has been created for artists and users who want to transform their desktop into an artistic tool and for those who want to play with graphic effects. That's because Linux users are not merely professionals and because computers are not reserved to business use alone." Visit the project's home page to learn more about the ideas behind the Ubuntu-based Hybryde Linux. Download the live DVD image (with support for French and English) from here: Hybryde-Fusion-release-live-dvd-i386.iso (1,716MB). 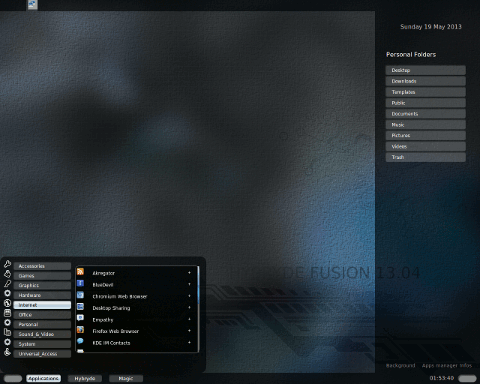 Hybryde Linux is an Ubuntu-based distribution for the desktop. Its most unusual feature is an option to switch rapidly between multiple desktop environments and window manager without logging out - the list includes Enlightenment 17, GNOME 3 (GNOME Shell and GNOME 3 "Fallback" mode), KDE, LXDE, Openbox, Unity, Xfce and FVWM. This is achieved via a highly customisable Hy-menu, which also allows launching applications and configuring the system. All open applications are carried to any of the available desktops. The system offers an interesting way to work fluidly in a multi-desktop environment. Olivier Larrieu has announced the release of Hybryde Linux 1, a desktop Linux distribution with one unique feature - the ability to switch rapidly and fluidly between a number of desktop environments and window managers without logging out and without having to close open applications first. The list includes Enlightenment 17, GNOME Shell, GNOME 3 "Fallback" mode, KDE, LXDE, Openbox, Unity, Xfce and FVWM. The switching between desktops is achieved via a customisable Hy-menu which also allows launching applications and configuring the system. The project's website is in French and by default the distribution only supports the French language, but extra language packs can be installed from standard Ubuntu 12.04 repositories. If you understand French please visit the project's home page to learn more about the concepts and techniques employed by this distribution. Download (MD5): Hybryde_Evolution_v1-live-dvd-32bits.iso (1,595MB, torrent).